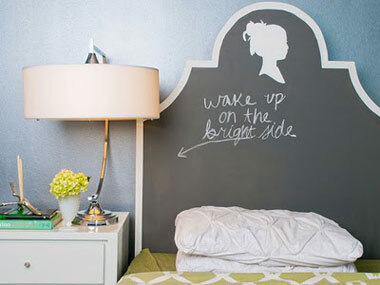 Ever heard of chalkboard paint? Chalkboard spray paint? If you haven't heard about it yet, now is the time! 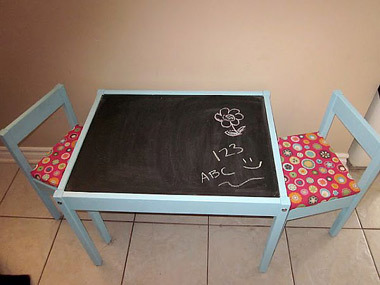 This DIY blog will teach you how to create a colorful, functional chalkboard in any room with chalkboard paint that's erasable, washable, and durable. 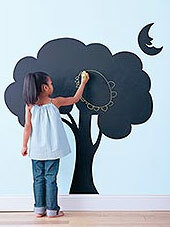 It's a great decor idea that will give your children the time of their lives! All you have to do is paint any surface or object with this black chalkboard paint and you've got a chalkboard right in front of you. Make sure to keep some chalk nearby for loads of doodling fun! Which room do you want to decorate? 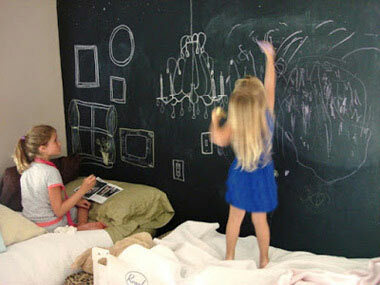 If you are fun and daring, choose a whole wall in your home to paint with chalkboard paint. Great spots would be a kid's bedroom wall, a playroom wall, or a classsroom wall. If you choose to do a small area, that's fine too! See Jim's room to the right. Jim loves basketball so his mom decided to paint a narrow area behind his bed with chalkboard paint and she placed a hoop at the top. It almost gives a tall headboard look! Jim has loads of fun writing down his scores and his mom loves writing bedtime reminders. Not interested in getting this stuff on your walls? Try it on wood, canvas, cardboard, the inside of a picture frame etc. Harry's dad hung this metal plank painted with chalkboard paint in their backyard so Harry can have a blast, but keep the chalk out of the house. Now you are ready to purchase your paints! Take a trip down to your local crafts shop. 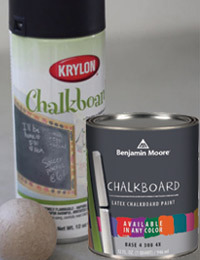 Many companies make chalkboard paint. Krylon makes a great spray paint and Benjamin Moore is great for regular paint. There are many colors available out there if you go for something other than black, although black is the standard chalkboard paint color. A) Getting Started: Clean the surface completely and repair any protruding nails or other imperfections. B) Tape The Area: The way to get started is to use some painter's tape to tape off the areas in which you want to paint. 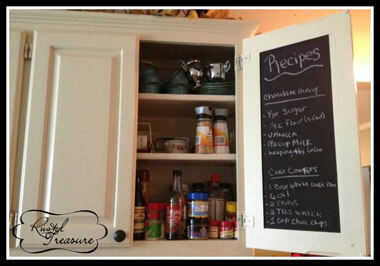 Regular chalkboard paint: Using a brush or roller, apply the chalkboard paint within the taped-off area. Spray paint: Spray the paint within the taped-off area. Use lots of thick tape because sprays tend to get quite messy. 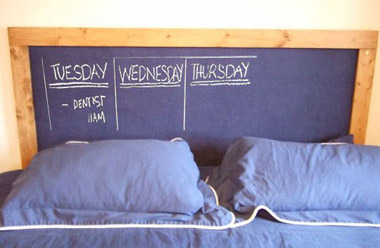 For best results, allow the painted area to cure for 3 days before using it as a chalkboard. Then, prior to initial use, rub the entire surface with a piece of white chalk. For erasing, it is recommended to use a clean, damp cloth or paper towel. It is not recommended to use a chalkboard eraser. Light color chalk will not leave residue after erased. Win a free unfinished step stool! 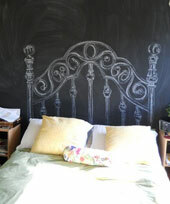 Use our DIY to paint with some chalkboard paint and SUBMIT your photos. Our designers will choose 3 winners that will receive a free unfinished step stool that can be painted with chalkboard paint! Get those ideas rolling! Winners will be chosen May 30th.